Roosevelt Diggs - Founders Brewing Co. 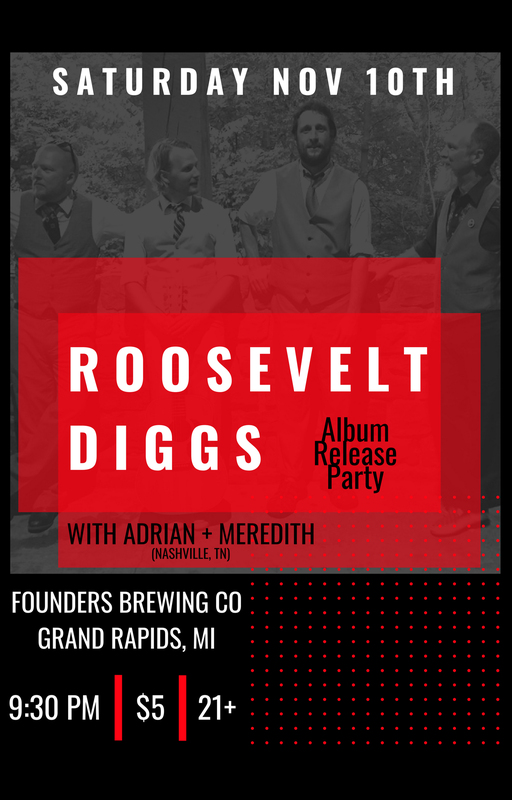 Since its beginning in 2008, Roosevelt Diggs has made its way around Michigan performing in some of the finest concert venues, breweries, and festivals. Whether it’s a high energy evening in your favorite brewery, a Wednesday afternoon at a music in the Park, or the opening set for a nationally touring act, their music was felt and embraced by audiences of all ages and musical preferences. The Fall of 2018 finds Roosevelt Diggs releasing their third album, “Better Days”. Better Days displays an evident growth in songwriting and arrangements from their 2014 release, “Songs From The Shed”. The album captures a band with over a decade playing music together recording in one of the areas finest studios, Third Coast Recording. Better Days harnesses the energy and flow from their live shows along with the shine of a superb studio album. Music is felt, not heard. Live music is an exchange of emotions from musician to audience and back again. It is something that cannot be harnessed with a silver disk or mp3. Roosevelt Diggs brings the wide influences of four individuals into one painted landscape. They focus their obsession for music into this live music setting…..for true Roosevelt Diggs, experience it live. In a city filled with country cowboys and sit-on-a-stool songwriters, Adrian+Meredith make a different sort of roots racket. More Than A Little, their debut record, finds the East Nashville-based duo putting its own spin on Americana music, roughing up the genre’s edges with the rule-breaking spirit of punk, the vintage twang of old-timey folk, the sneer of rock & roll, and even the frenetic bounce of early Swing and Jazz manouche. Both coincidentally from the Detroit area, Adrian was raised on punk-rock in the DIY history of Washington DC, with a carnival barker’s croon and an off-the-wall “clawhammer banjo” approach to the acoustic guitar. Meanwhile, Meredith was Michigan-music native who cut her teeth in the old-time music scene, where she played traditional fiddle and clogged. Since then, the pair’s have been touring relentlessly, swapping harmonies, trading solos, and acting as co-pilots throughout their debut album, and US and European tours.